Like many good ideas, MAD//Fest came to fruition in a pub. A motley crew of marketers, start-ups, disruptors, tech types and media folk started talking about events over a few beers. Wouldn’t it be good if there was an event that actually brought together the great and the good? Something that packs a punch with no-nonsense, relevant content? A space where people can have a bit of fun rather than fall asleep in the back row? And so, three pints in, MAD//Fest was born. We believe in making an event that people want, not force feeding the same tired trade show format on people who want more value for their time and money. This means bucketloads of inspiring content and thousands of cherry-picked industry influencers to meet and feast on new ideas, relationships and partnerships. So this event is for you, the people who are carving out the future of marketing, advertising and technology. Meet the biggest brands and freshest start-ups. Join our celebration of London’s unique identity as a hub of innovation, creativity and culture. What does this mean? Check out our charter to see what we’re all about. 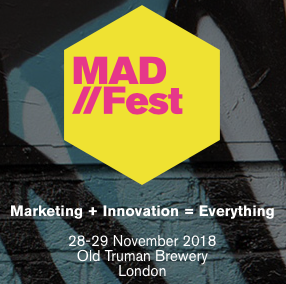 Do you want to engage with CMOs, lead industry debate, solve challenges, show the path to new opportunities, pitch big ideas or be seen by the world’s top brands, agencies, publishers and tech providers? If so, sponsorship might be right for you. Present your vision in 20 minutes in the conference programme. Lead a practical workshop and provide solutions to real life challenges. Be the party provider, throw some shapes until late or provide a genuinely inspiring experience for 2000+ creative people! We’ve got a variety of high impact activations to suit a range of different businesses and budgets. Alternatively, tell us what you want to do and we’ll make it happen.